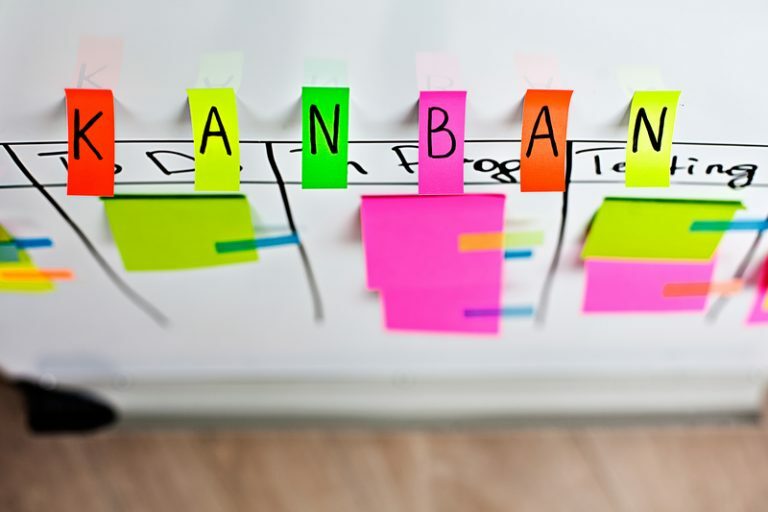 The Kanban board is a lean tool for managing flow in a process. From simple processes to the most complex, the board will visually represent a every step in a process process and show the status at any given time. During the late 1940’s, the line workers at Toyota displayed colored Kanbans to notify downstream workers that a demand existed for parts or assembly. As early as 2005, the Kanban board tool started being applied to knowledge work, where processes are typically more opaque than in the manufacturing sector. When a process is mapped out on a Kanban board and Kanban cards properly represent the work, the process becomes visible and hidden aspects of the work becomes more clear. By mapping out the process, the entire team process is visible to every member and provides more clarity in their sense of purpose. The information displayed will answer the basic questions of who, what, when, where, why and how. There are three basic steps in establishing your Kanban board. Map Your Workflow – Documenting the steps of a process. The starting point is exactly what it is in the real world. For every step, consider the tasks required to complete the step. Now it is time to build your Kanban board. Visualize Work in Process (WIP) – Once your process is mapped on the Kanban board, start adding the tasks. Every task that should be done or worth doing, name them so everyone understands and put them in place. Set Your WIP Limits – Early on, it will be a challenge to understand the ideal amount of work in a process. Start with your best guess. With your WIP limits in place, put them on the Kanban board. It is important to remember, Kanban is a ‘pull’ concept. This means when someone is ready to do work, they look on the board to see what needs to be done and will pull the task into the next column. The task is then their responsibility until it is complete and someone pulls it to the next step. The natural process of the Kanban board will start revealing bottlenecks in any process and quickly identify inefficiencies. Learn from mistakes and move your processes forward! The post Kanban Board Optimizes Efficiency and Process appeared first on Shmula.